Yesterday's road bike issues present me with a situation. I'm likely to be road bike less for 1-3 weeks, and thus need to re-plan my training. So, what do I do until I'm back aboard the blue beast? Do I sub in a weights block? Do I put skinny tyres on my CX wheels and use it as a road bike much like I did in 2012 when my Madone met an untimely end. Do I leave the 32mm tyres on and ride a lot of dirt? Do I dust off (literally) the track bike, and get it out on the boards again? I'm leaning towards a combination of weights and getting dirty on the cross bike. I had planned on heading North of town today, but my road bike had not one, but two catastrophic failures before I'd even got out the door. First my rear dérailleur cage fell off, that by itself was enough for me to change my plans to involve my CX bike. So while waiting for some more light, I took the time to true my rear wheel a little, which is when I discovered a complete failure of a hub flange. Anyway those two issues took a lot of wind out of my sails, and I opted for a knobby tyred shop ride. Even with 9mm more tyre and 60psi less than everyone else, I was able to roll my fair share of turns in the fast group, thanks in part to the ripping northerly that kept our speeds within my gear range. So Cadbury, the chocolate company, seems be be experimenting with new flavours and/or cross market malarky at the moment. Don't know what I'm talking about? 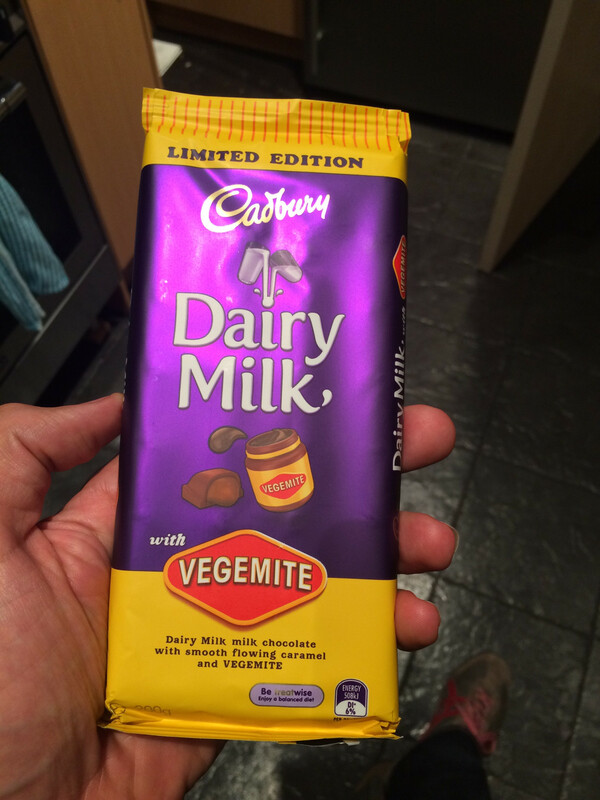 Chocolate with Vegemite. Yep, sounds odd... but oddly appealing... but really odd. See, this is where I'm here to help you, to buy a 200g block and eat it. Not only that, eat it as race food, and evaluate it's performance in a performance setting. This blog is about riding bikes after all! I've never reviewed chocolate or yeast extract spread before, but I've eaten more than my fair share, so I'm going to go ahead and give myself the nod to carry on with a review of a combined product. The first thing you should know is that it's not just chocolate and vegemite, no, it's chocolate, caramel and vegemite. Put another way, it's choclate with a salted caramel centre. Sounds a lot more appealing now doesn't it? I'd go so far as to say it tastes good. I gave a try to quite a few people, and even the tiny Canadian (who is staunchly anti-vemegite) agreed it's not bad, and at best/worst it only has a hint of vegemite at the end of the palate. So how's it go as race food? Well sadly I didn't get to finish off yesterday's race, but even by the time my front tyre ceased to love me, I was feeling like the sugar high was waning. I was feeling pretty happy though, so it's possible that the extra (added) B vitamins of the vegemite were bouying my mood more than normal. 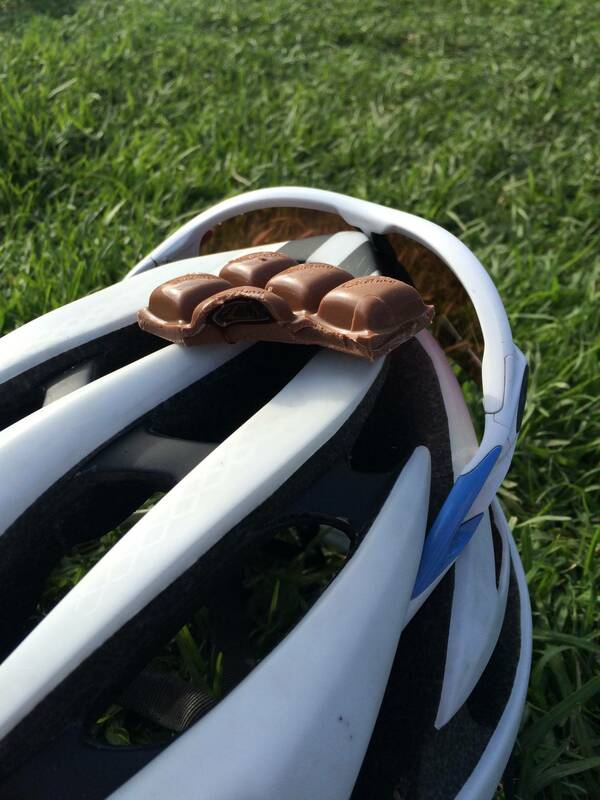 So I reckon that's an advantage over cramming a regular chocolate block in your face before a VO2 smash fest. I wanted to get a few kms this morning, but not destroy myself. I figured I'm racing today, but that the race isn't the be all and end all, so some extras would be good. Anyway, the easiest option was ye olde shoppe, with some turns in the faster group on the way back. DK was out, and making sure everyone got an extra workout each timed they rolled through. He was taking great pleasure from holding the pace high each turn, to ensure everyone had to really work to get over the top of him. I rode across town to the Brunswick velodrome, and pinned on a number for a grade. Other than a general Pepe Lepew strategy, it was all I'd planned and hoped for the arvo. I let most people through at the start, and then after a couple of laps to settle in, I started to work my way through the field. With so many hairpin turns bunted into the grass inside and outside the velodrome it wasn't always easy. By about 3/4 of the way in, I'd finally got myself past big Al from My Mountain, I knew Russ Collette was ahead somewhere and had begun to review where on the course I could make up time, and how best to manage the first signs of cramps in my quads. Sadly that's as far as my racing went. Over the back towards the club house I suddenly found myself on the deck, my front tyre burped of all it's air. The results say I was in 10th at the time, around 4 minutes off the pace. I think I miiight have been able to push on for 9th, and that's kind of cool. That's me not only riding semi competetively, but also my brain thinking about competing. It gives me confidence to hurt a little more and to race a little more. I simultaneously remember this ride as 100% having a chat, and 100% half wheeling shenanigans. Obviously they're mutually exclusive, and they're equally probable given I was riding with Ricky... so I'm really not sure what the story is here. The best I can come up with is there was some kind of compromise, but that doesn't sound like Rick and I riding together at all! The route for the morning was ye olde burbs loop in reverse. Maybe trying to remember all the descents from years ago when I last rode the bunch was what's causing the uncertainty of how we rode. After some eggs and a couple of coffees I rolled home. I got myself over to the boulevard, I figured it would make a nice quiet route, but it was only when I was on it that I remembered if you pass Yarra St, you go up Yarra St. I feel like I'm struggling to hold decent cadence at the moment, maybe it's that I wasn't pushing hard on the pedals today, maybe its that I've been doing more riding and am tired. Whatever the reason, 80rpm was my happy place. Today was the a day for CX bikes on the Belgie, as the birthday boy Pikey demonstrated best when he fishtailed his road bike up the single track climb up to Pony club. The CX protagonist was Bing, he was hard up the cobbled Ivanhoe alleys, and again up the afoer mentioned single track climb. I did what I could to stay near him, but always had a sense that at any second he could choose to ride away. The high heart rate bits aren't what stick most with me from today though. What sticks was the tiny, greasy, singletrack descent after they alleys. Bing hit it first and though I was on his wheel at the start, he had comprehensively gapped me by the bottom. Adding this question about line choice/over braking/cornering ability to concerns about my fitness, it paints a painful picture of what is to come at DDCX this Saturday. Strava premium comes with a few Sufferfest vids (thank's Leigh for the reminder), and I've heard good things, so instead of another 5x5, or ladder, I decided to give "There is no try" a shot. I've gotta say, I struggled with it. The issue was what power/intensity to be going at at any given moment. Sure, there were instructions stating stuff like 7/10 (on a perceived effort scale), but I was never sure if it meant go at 70% of what I could do for the duration, or 70% of my max TT effort, or 70% of my sprint. In other words, I longed for power figures to go on. I may pre-calculate some power numbers in the future, but that takes away from the simplicity of just looking at one place (the screen). Maybe with time I'll learn the required levels, in the mean time, I need another coffee. This is going to sound crazy, but hear me out. Riding at lunchtime is actually pretty good, especially when the sun is out. Crazy right? Yeah, well today I rode sans arm warmers, sans gillet, sans gloves, sans leg warmers, and sans hat. Yep, just bibs and a jersey, and it was amazing. I did a quick survey last night, seeing who was riding and where. Given the ongoing soreness in my legs I thought it best not to go to the Nongs with DK and Smax, so instead opted for Patto with Leigh Aitken. Speed records were not broken, and Strava KOMs were not threatened, but it feels like the right choice. The pain will come on Tuesday, Ricky will ensure I'm hurting, and I'll ensure he is. It's a mutually benef-owch-al relationship. I'm feeling a lack of motivation to suffer on the bike. I'd like to be faster, but it's not a desire akin to a raging fire inside. That relates to today, because I would have been solo north of town, and suspected I wouldn't have the will to push myself. So instead, I rolled the helly figuring having people around would keep me honest. The hills were a success, Alistair Donahue rode the bunch off his wheel, then Bensley broke me by riding past and casually commenting that I seemed to be in reasonable form. It should be noted that when Nick rode past, my heart rate was so frantic I'm surprised he wasn't knocked from his bike by a vein jutting out of my temple. The return leg did have some interest, with riders firing off attacks almost the entire way, but my part in it was purely reactive, so I don't think it deserves much comment. The tiny Canadian is doing a bit of running, and is working on the pose method of doing so. Anyway, today was a skills/drills day for her, and when she asked if I'd like to come along, I decided to give it a go. We did some stuff that didn't involve a bike, I felt like (more of) a spaz, and I pulled the pin early because I was starting to tighten up in the baby cows, adductors and hamstrings. Given the nice forecast, I wanted to be able to ride tomorrow. On my way home from the ride north of town, I ran into Youngie coming home from Northy. I did a quick u-bolt to say g'day and found that we'd had very different experiences. From what he said Northy started off fast, then once it turned for home everyone played nice and worked together. Our ride on the other hand featured Ricky half wheeling me on the front until Rosehill Rd, then him playing witness the fitness while the rest of us scrabbled to even hold his wheel. It's made me consider my stance on pre-ride caffeination, perhaps it's necessary to throw one back at 5:30am on Tuesdays. Not many know this, but my first career was in corporate banking. Have I told the joke about the mule yet? I think you'll get a kick out of it. I did a few things yesterday, but surprisingly it wasn't the weight session that affected today's ride the most. No, it was the act of washing my bike after the easy roll that made the biggest difference... it made contort myself to avoid hitting any wet patches on the trail. That's not to say my legs weren't sore, or that that didn't affect the ride. It did, things weren't too feisty, and I ended up taking us near enough on a reverse of Wednesday morning's Belgie. If I'd been trying to do it, I would have failed, but somehow... I missed every drop of rain to get a sneaky roll around the back of Port Melbourne today. I whacked a heel wedge under my feet for the last two sets of squats. I've never used one before, and given it was just in front of me, it seemed like a simpler and far less expensive test than buying weight lifting shoes. Given I was barely touching on body weight, I'm going to withhold judgement. I'm not sure if it was Pikey, or Adam from Curve that started this ride, but whomever it was deserves some praise because I had a blast. A bunch of different riders, on a bunch of different bike styles, on a bunch of different surfaces, attacking each other. Surely that's the flourless chocolate cake of grail of bike riding recipes. Delicious, gluten free, and quick! I swear that Adam was paying off riders though, several times, he'd attack off the front, and the rider behind him would block the race line. Eventually there'd be a pass, and the rabbit chasing would begin. With a few hours before Dawn to ride, I was torn between the divergent desires of exercise and sleeping. I knew that I wanted to pump something, but given the gym wasn't going to open until 8am, iron was out of the question. Instead I settled on pumping some track under the Westgate bridge. Some crafty people built a pump track a few years back, and I was keen to give it a while. Once in the rhythm of it, pedalling became unnecessary, and brakes were neglected. Soon enough though, it was time to roll out, along trails and paths that I hadn't seen since racing close to a decade, back when Snozza was running the show. Past the spot where Caddy and I had tangled ourselves before a race, ending up on the ground in a confused pile of boys and bikes. Up and over the hill that Tristan Bennet and I went shoulder to shoulder at the end of a b grade crit, digging deep into legs already aching from 40 minutes of racing. I went into the last corner first, but lost traction on some gravel, and watched Tristan rail his singlespeed underneath me for the win. When the tiny Canadian complains about all the poisonous things in Aus, I generally point out that most of them don't care about you, where as In Canada things will actively hunt you as a tasty snack. Today's ride changed my views a little because two of our native and one introduced fauna made it seem like they wished us to fall heavily from our bikes, and were willing to sacrifice themselves to achieve it. It was not long after the sun began to cast a beautiful pink, orange and red glow over the Eastern sky (#nofilter), that a dusky coloured fox went careening in front of Jimmy and I. As we wound our way deeper into the country side, small roos took their turn to burst from the trees and ensure our heart rates peaked. Finally, after we'd met, rode with, then waved goodbye to Fewy, a Black Tailed Wallaby gave us a fright on the normally quiet Christian Rd. I'm sure the German's have a term for when you take an action based on an assumption, but the assumption and thus action end up being in error... yet you still feel no regret. Anyway, that's what happened today with the decision to wear a gilet. It wasn't needed, in fact it caused a minor sweat to occur, but it didn't cause regret, because who can be upset about bibs and jersey riding weather?